First, all Participants need a Topic they would like to improve or a Problem which need to be solved, their personal improvement Topic for this Retrospective. 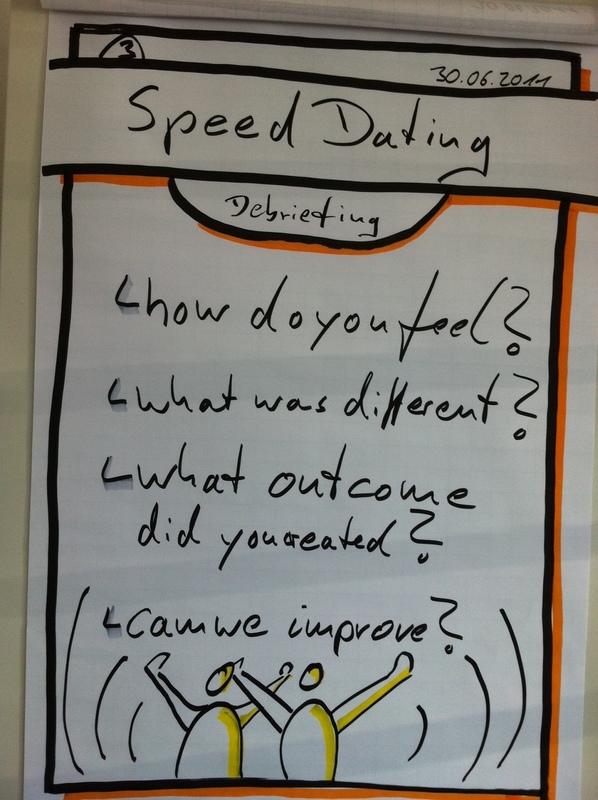 After this first exercise, which takes about 10 Minutes, you have all Participants in the right flow and mood for a discussion about their Topic. You have activated both sides of their brain, the left side for rational thinking by writing down the 5 KeyWords/Sentences. And the right side of their brain, the creative part, by drawing a Picture. This is the best starting Point for what is coming next. Let Participants pair and give them a strict TimeBox. Every Pair has exactly 10 Minutes. First 5 Minutes to discuss the Topic of Person A and finding possible Solutions or Improvements – write them down on your IndexCard – if needed take a new Card. After 5 Minutes the Pairs change, what means that now Person B will discuss her Topic and write down possible Solutions or Improvements. After 10 Minutes you build new Pairs and start the exercise again, first Person has 5 Minutes and Person B has 5 Minutes as well. 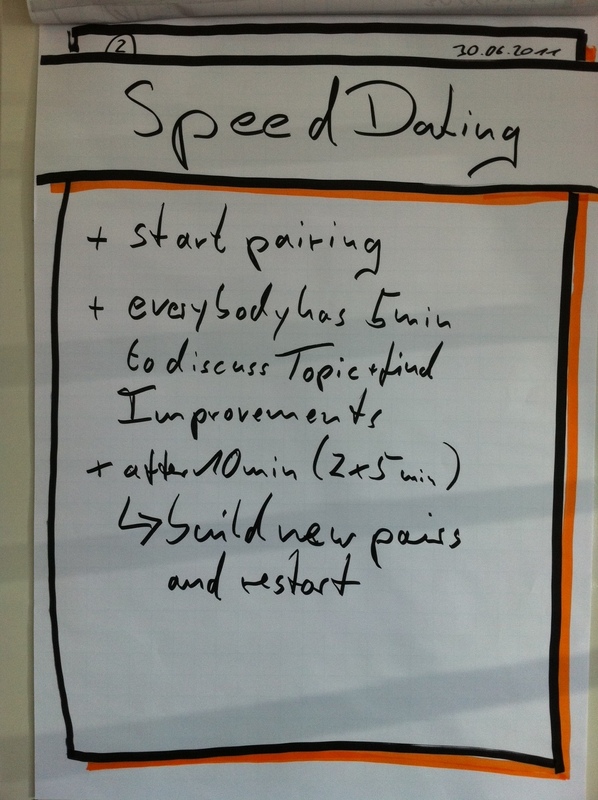 Build new Pairs and repeat until every Participant has talken exactly once to all other Participants! how does it felt, how do you feel right now? what outcome have you created? can we improve this Process? After the Debriefing we start the Action Planning. Every Participant should have at least one IndexCard with possible Solutions or Improvements for her personal Topic. 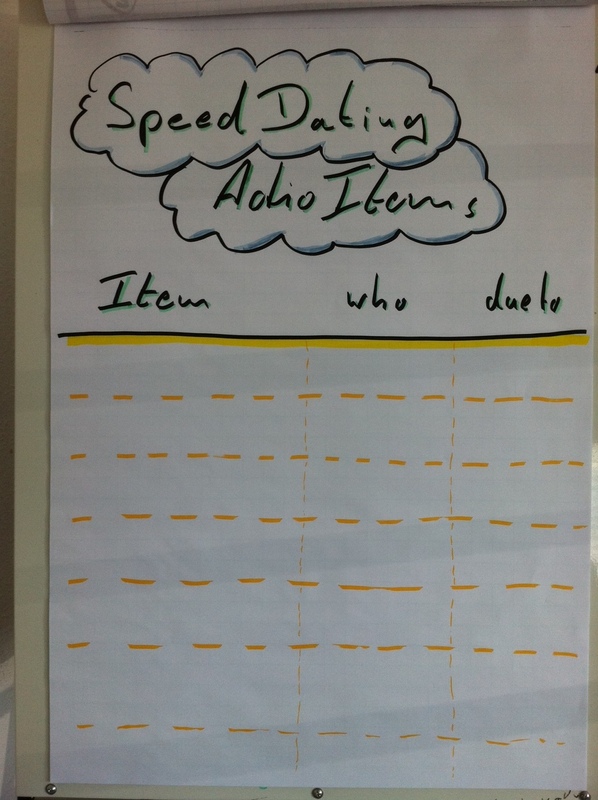 Ask every Participant to choose just one Action she would like to adress in the next Sprint, choose the most powerful Action and write them down on a FlipChart – Topic, Responsible and due Date. If you have an odd count of Participants just invite another Stakeholder or a TeamMember of a different Team. This Person has no own Topic to discuss but can contribute, comment and add Value from a complete neutral point of view!